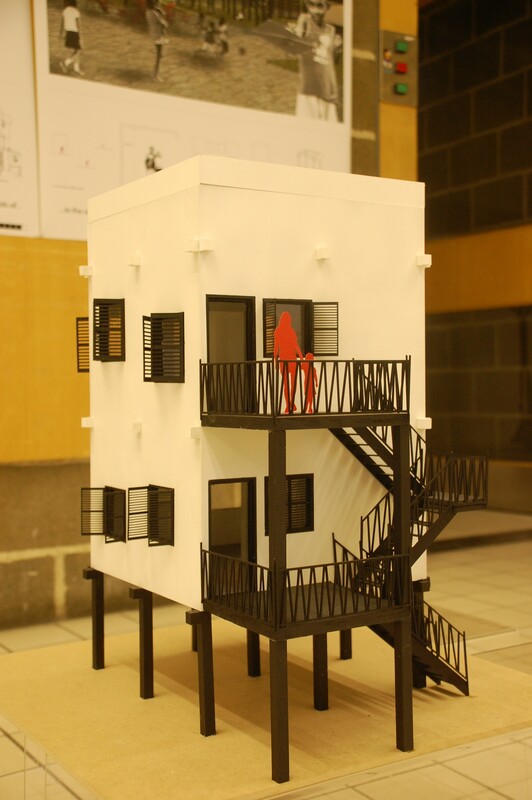 This, our fourth project, is the Master’s Project in Architecture by the AES member Frida Boström. 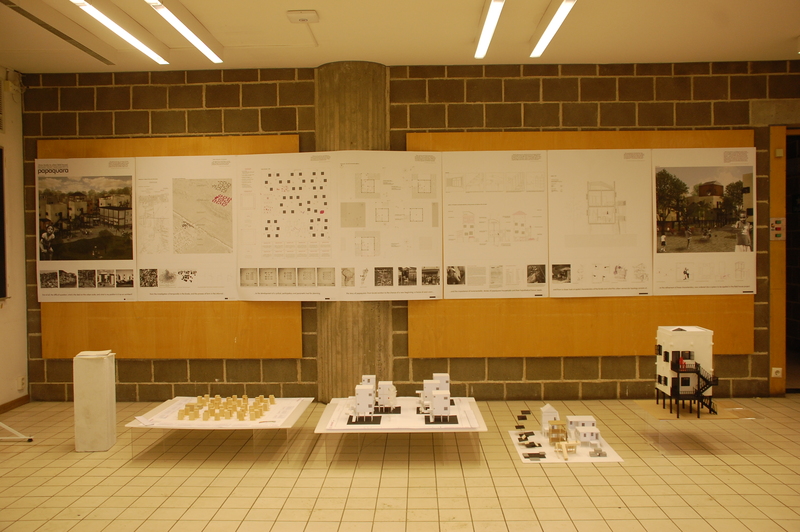 The project was presented at the final critique at the KTH, Royal Institute of Technology in Stockholm, in January 2012. The community of Papaquara consists of 53 families, of which half of the adult population works in recycling, a.k.a. collection, organization and selling recyclable garbage from areas on the north of the island Florianópolis. The island is in its turn situated on the south-east coast of Brazil. The community lived in a favela (best translated as a kind of Brazilian slum, which means an irregular, auto-constructed illegal settlement lacking planned infrastructure) close to the river Papaquara. 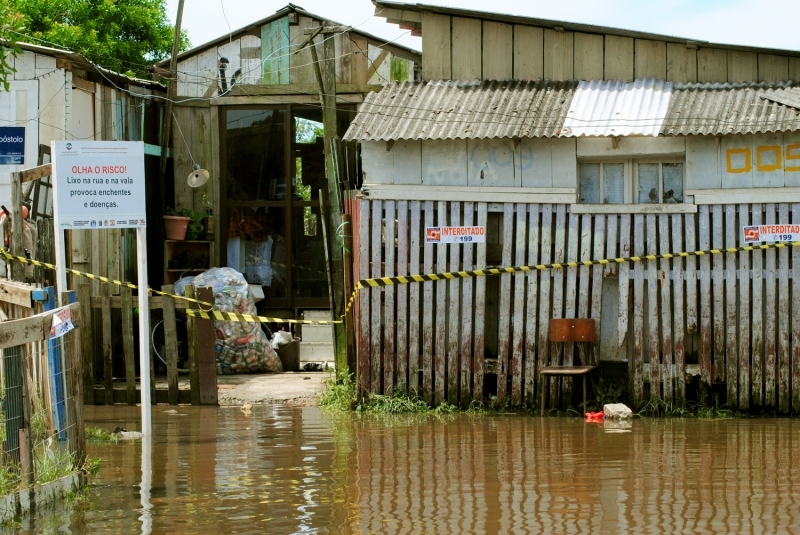 During February 2011, the houses in the favela were flooded with water reaching up 1,50 meters of height, this caused by a combination of heavy rains and the tidal water rise of the river. 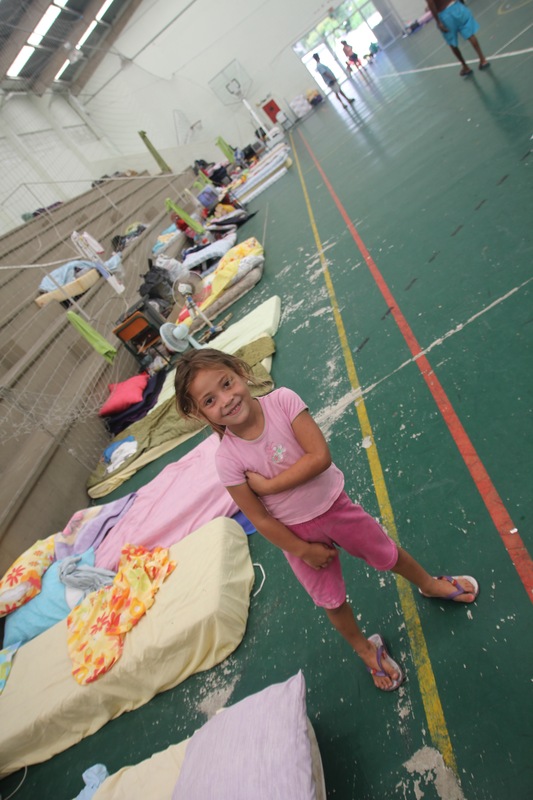 The community, in total about 190 people, were then evacuated and had to sleep in the gymnastics hall in a school located nearby. While evacuated, the Prefeitura (the municipality of Florianópolis) entered the favela and demolished all the houses, leaving nothing but flat land behind, and a negotiated 6 months of rental money for each family. This action on part of the local municipality, while claimed to be a security measure taken to save people from living in vulnerable environments, is also a result of the unspoken will to remove unwanted communities from valuable terrain and this way open up for land speculation and private development initiatives. Now, in Brazil, there are programs for construction of social housing, financed through the federal bank Caixa Economica. 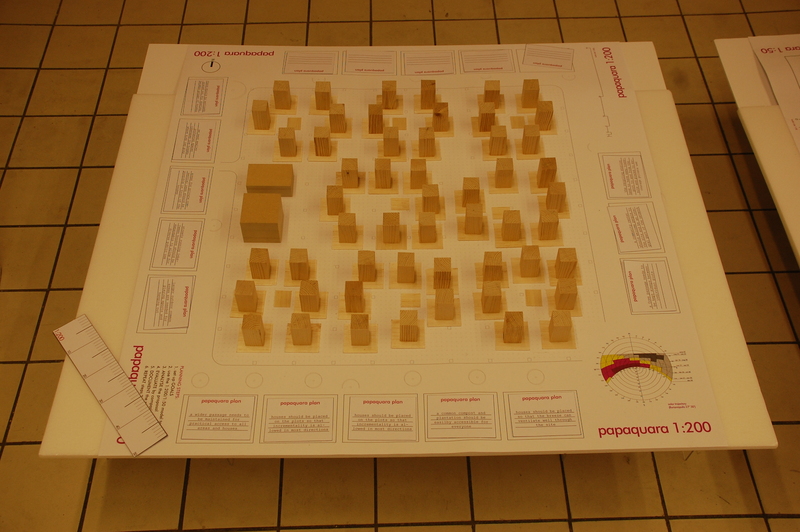 And hopefully in the future, there will be new housing produced for the community of Papaquara. However, as the question of land tenure is one of the biggest issues in Brazil for poor people, this question is a political one indeed, and the first step for this housing process to be realized is to secure a piece of land that can be retrieved by means of purchase or donation from the national government. In this project, I have made the assumption that a piece of land on the north side of the Papaquara river can be secured and used for building. While the design of social housing might take a million different appearances, and the case in Brazil is mostly that of proposing a highrise structure for apartment dwellings, this particualr project takes a somewhat different jump-off point. Here, the social and physical construction of a favela is investigated, with the argument that when the final user is building the house with his or her own hands, when there exists no initial overall plans made by architects or urbanists, certain spatial situations evolve. Such is, the uses of roof terraces, the creation of irregular plans and sections, external stairs, a fluid spatial connection from interior to exterior spaces, the mixed uses of the street level of houses etc. So, initiating this project, a thorough study of the development of favelas, in this case in Rio de Janeiro and in Florianópolis, was conducted. 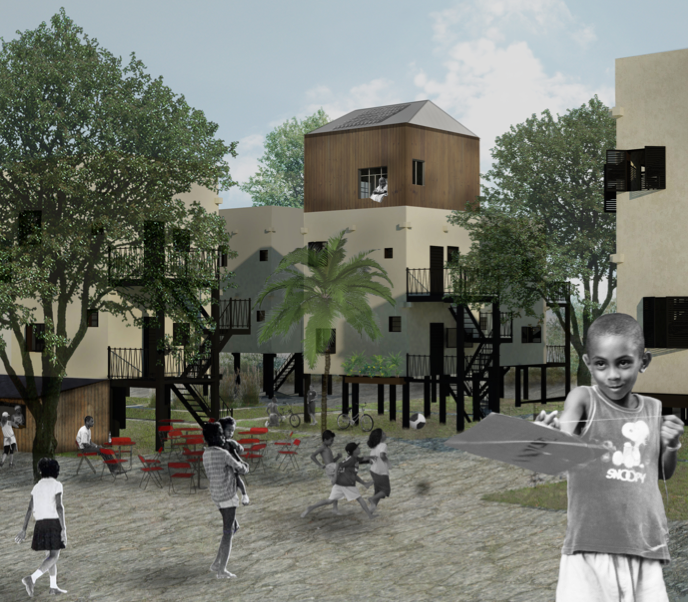 The idea was to identify core architectural elements and their uses in a “favela way of building”, and then try and reformulate and redefine them in a more sustainable and more properly constructed manner. 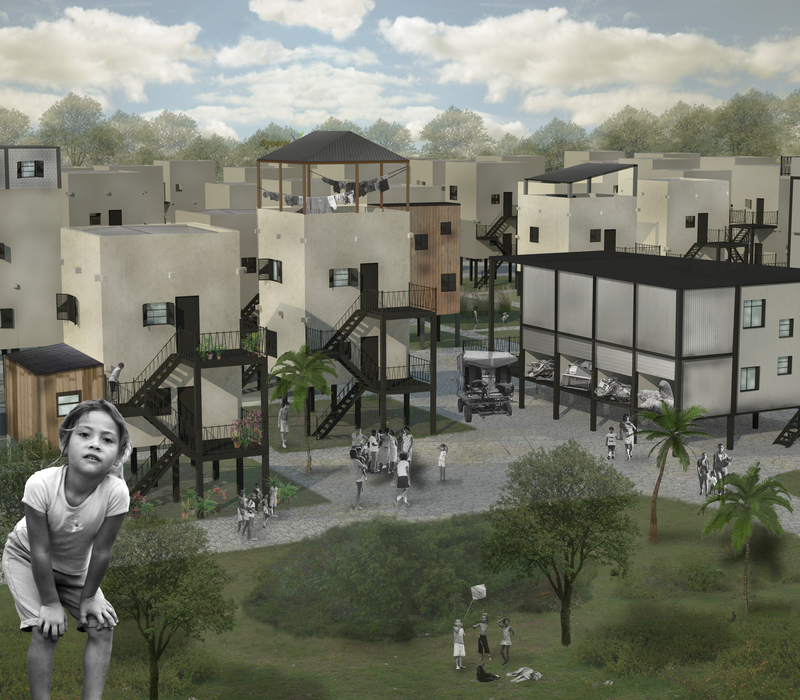 In the end, the proposal consisted of a couple of architectural, temporality-driven strategies and methods, for the development of an “upgraded favela”- project. The first method developed was a reverse or cyclical way of planning, where the process starts not in laying down streets and infrastructure, but in establishing spatial qualities that you and your co-planners want the plan to achieve. In practice, this means writing down a set of spatial goals on cards and keeping them close at hand throughout the planning process. 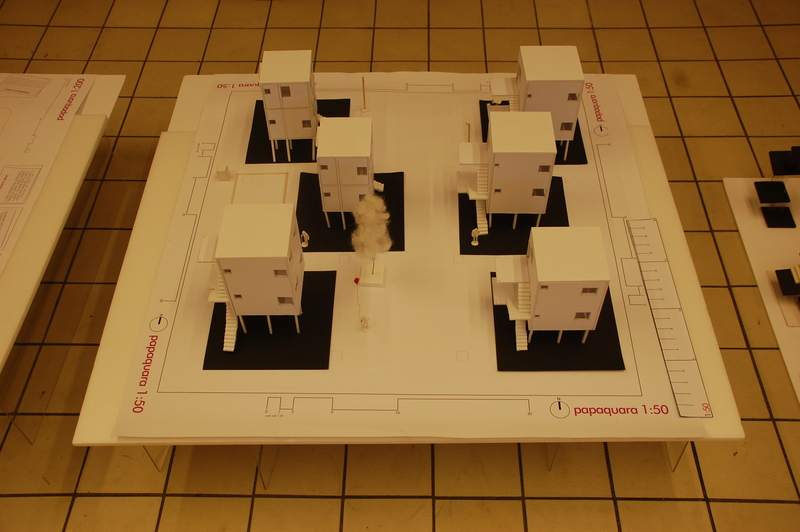 Models of the site are needed, preferably in two different scales to be able to experience outcomes both from a distance and more closely. To make things handy, the models/plans should be cheaply and easily produced, built from simple materials and clear in their communication. From here on, you start the planning by making different versions of the model that you can compare, analyse, discuss and document in a cyclical process, until a result is reached that everyone or at least most people included in the process can agree on. This way the planning becomes more experimental and less focused on finding one imagined perfect solution. The relationships between the houses, and between houses and common spaces and the site is allowed more importance in the first round than establishing limits, streets and plots. The intention of the planning tool is also to be useful irrespectively of setting; in an academic institution, together with a group of community residents, or in a meeting with public authorities. Money being scarce in a social housing program like this one, assets have to be directed to where they are most needed, and where they are most likely to enable future development. In the construction phase, what is built is a good climate shell and one complete wet core on the ground floor, with kitchen and bathroom. Money is not spent on interior division walls, since these have no specific requirements and can be added by the inhabitants using whatever recycled or cheaply bought material they can put their hands on. Instead, money is put down towards a protective layer of plaster on the inside and outside, as well as perforated concrete nibs protruding from the loadbearing construction. Although development is hard to foresee exactly, incrementality is to be expected as families expand over time and needs to be facilitated. An effective way of doing this is to provide parts of the loadbearing structure that can help carry the weight of any new add-ons. The roof is divided into one proper slab and a second structure of a light metal roof, creating a ventilated space inbetween suitable for keeping water tanks. Developing strategies for handling infrastructural concerns was of course also of huge importance in the project. Since the community already has a good awareness of recycling, there are positive incentives to create a system that would integrate management of water reuse, electricity minimizing, sewage planning and waste disposal. The section above shows a diagram of how use of precipitation and solar heating of water can be employed on the individual household level. On the community scale, an educational centre and a recycle workstation as well as a large compost are planned for, and the house clusters share wetlands for the cleaning and reuse of grey water. The proposal for new housing developed in this project is based firmly in real circumstances. Because of its slow political dimension, however, it is certain that the implementation of any real housing plans will stretch beyond the scope of this Master’s project. This is also sure to require further prescence and collaboration with the community on site in Brasil. The AES will sustain continuous involvement as the project unfolds in Brasil, and will strive to gain the financial support needed to parttake in future development of a viable practical plan of action for the community of Papaquara.